Should We Stop Talking About National Security? The question of how foreign policy is determined is a crucial one in world affairs. In these comments, I can only provide a few hints as to how I think the subject can be productively explored, keeping to the United States for several reasons. First, the US is unmatched in its global significance and impact. Second, it is an unusually open society, possibly uniquely so, which means we know more about it. Finally, it is plainly the most important case for Americans, who are able to influence policy choices in the US—and indeed for others, insofar as their actions can influence such choices. The general principles, however, extend to the other major powers, and well beyond. There is a “received standard version,” common to academic scholarship, government pronouncements, and public discourse. It holds that the prime commitment of governments is to ensure security, and that the primary concern of the US and its allies since 1945 was the Russian threat. The US immediately invaded Panama, killing probably thousands of people and installing a client regime. This was routine practice in US-dominated domains—but in this case not quite as routine. For first time, a major foreign policy act was not justified by an alleged Russian threat. Instead, a series of fraudulent pretexts for the invasion were concocted that collapse instantly on examination. The media chimed in enthusiastically, lauding the magnificent achievement of defeating Panama, unconcerned that the pretexts were ludicrous, that the act itself was a radical violation of international law, and that it was bitterly condemned elsewhere, most harshly in Latin America. Also ignored was the US veto of a unanimous Security Council resolution condemning crimes by US troops during the invasion, with Britain alone abstaining. The administration of George H.W. Bush issued a new national security policy and defense budget in reaction to the collapse of the global enemy. It was pretty much the same as before, although with new pretexts. It was, it turned out, necessary to maintain a military establishment almost as great as the rest of the world combined and far more advanced in technological sophistication—but not for defense against the now-nonexistent Soviet Union. Rather, the excuse now was the growing “technological sophistication” of Third World powers. Disciplined intellectuals understood that it would have been improper to collapse in ridicule, so they maintained a proper silence. One of the most interesting provisions of the new plans had to do with the Middle East. There, it was declared, Washington must maintain intervention forces targeting a crucial region where the major problems “could not have been laid at the Kremlin’s door.” Contrary to fifty years of deceit, it was quietly conceded that the main concern was not the Russians but rather what is called “radical nationalism,” meaning independent nationalism not under US control. All of this has evident bearing on the standard version, but it passed unnoticed—or perhaps, therefore it passed unnoticed. Other important events took place immediately after the fall of the Berlin Wall, ending the Cold War. One was in El Salvador, the leading recipient of US military aid—apart from Israel-Egypt, a separate category—and with one of the worst human rights records anywhere. That is a familiar and very close correlation. The Salvadoran high command ordered the Atlacatl Brigade to invade the Jesuit University and murder six leading Latin American intellectuals, all Jesuit priests, including the rector, Fr. Ignacio Ellacuría, and any witnesses, meaning their housekeeper and her daughter. The brigade had just returned from advanced counterinsurgency training at the US Army John F. Kennedy Special Warfare Center and School in Fort Bragg, North Carolina, and had already left a bloody trail of thousands of the usual victims in the course of the US-run state terror campaign in El Salvador, one part of a broader terror and torture campaign throughout the region. All routine. Ignored and virtually forgotten in the United States and by its allies, again routine. But it tells us a lot about the factors that drive policy, if we care to look at the real world. All of this, too, was routine, as was the silent acceptance and approval of the expansion of NATO in the US and the West generally. President Bill Clinton then expanded NATO further, right up to Russia’s borders. Today, the world faces a serious crisis that is in no small measure a result of these policies. Another source of evidence is the declassified historical record. It contains revealing accounts of the actual motives of state policy. The story is rich and complex, but a few persistent themes play a dominant role. One was articulated clearly at a Western Hemispheric conference called by the United States in Mexico in February 1945 where Washington imposed “An Economic Charter of the Americas” designed to eliminate economic nationalism “in all its forms.” There was one unspoken condition. Economic nationalism would be fine for the US, whose economy relies heavily on massive state intervention. That, of course, will not do. Washington understands that the “first beneficiaries” should be US investors, while Latin America fulfills its service function. It should not, as both the Truman and Eisenhower administrations would make clear, undergo “excessive industrial development” that might infringe on US interests. Thus Brazil could produce low-quality steel that US corporations did not want to bother with, but it would be “excessive,” were it to compete with US firms. Similar concerns resonate throughout the post–World War II period. The global system that was to be dominated by the United States was threatened by what internal documents call “radical and nationalistic regimes” that respond to popular pressures for independent development. That was the concern that motivated the overthrow of the parliamentary governments of Iran and Guatemala in 1953 and 1954, as well as numerous others. In the case of Iran, a major concern was the potential impact of Iranian independence on Egypt, then in turmoil over British colonial practice. In Guatemala, apart from the crime of the new democracy in empowering the peasant majority and infringing on possessions of the United Fruit Company—already offensive enough—Washington’s concern was labor unrest and popular mobilization in neighboring US-backed dictatorships. That causes problems. The US somehow finds it difficult to appeal to the poor with its doctrine that the rich should plunder the poor. As the CIA explained, “The extensive influence of ‘Castroism’ is not a function of Cuban power.… Castro’s shadow looms large because social and economic conditions throughout Latin America invite opposition to ruling authority and encourage agitation for radical change,” for which his Cuba provides a model. Kennedy feared that Russian aid might make Cuba a “showcase” for development, giving the Soviets the upper hand throughout Latin America. The State Department Policy Planning Council warned that “the primary danger we face in Castro is…in the impact the very existence of his regime has upon the leftist movement in many Latin American countries…. The simple fact is that Castro represents a successful defiance of the US, a negation of our whole hemispheric policy of almost a century and a half”—that is, since the Monroe Doctrine of 1823, when the US declared its intention of dominating the hemisphere. The immediate goal at the time was to conquer Cuba, but that could not be achieved because of the power of the British enemy. Still, that grand strategist John Quincy Adams, the intellectual father of the Monroe Doctrine and Manifest Destiny, informed his colleagues that over time Cuba would fall into our hands by “the laws of political gravitation,” as an apple falls from the tree. In brief, US power would increase and Britain’s would decline. In 1898, Adams’s prognosis was realized. The US invaded Cuba in the guise of liberating it. In fact, it prevented the island’s liberation from Spain and turned it into a “virtual colony” to quote historians Ernest May and Philip Zelikow. Cuba remained so until January 1959, when it gained independence. Since that time it has been subjected to major US terrorist wars, primarily during the Kennedy years, and economic strangulation. Not because of the Russians. The pretense all along was that we were defending ourselves from the Russian threat—an absurd explanation that generally went unchallenged. A simple test of the thesis is what happened when any conceivable Russian threat disappeared. US policy toward Cuba became even harsher, spearheaded by liberal Democrats, including Bill Clinton, who outflanked Bush from the right in the 1992 election. On the face of it, these events should have considerable bearing on the validity of the doctrinal framework for discussion of foreign policy and the factors that drive it. Once again, however, the impact was slight. It was, for example, the reasoning behind the decision to oppose Vietnamese nationalism in the early 1950s and support France’s effort to reconquer its former colony. It was feared that independent Vietnamese nationalism might be a virus that would spread contagion to the surrounding regions, including resource-rich Indonesia. That might even have led Japan—called the “superdomino” by Asia scholar John Dower—to become the industrial and commercial center of an independent new order of the kind imperial Japan had so recently fought to establish. That, in turn, would have meant that the US had lost the Pacific war, not an option to be considered in 1950. The remedy was clear—and largely achieved. 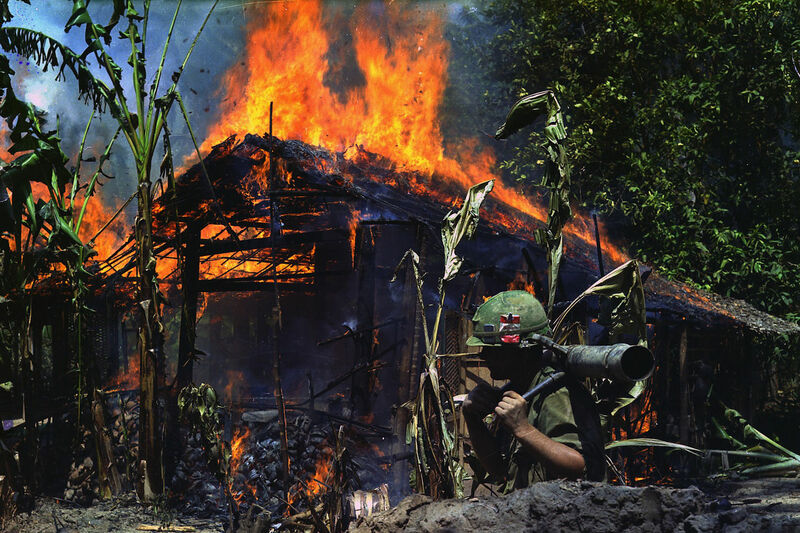 Vietnam was virtually destroyed and ringed by military dictatorships that kept the “virus” from spreading contagion. In retrospect, Kennedy-Johnson National Security Adviser McGeorge Bundy reflected that Washington should have ended the Vietnam War in 1965, when the Suharto dictatorship was installed in Indonesia, with enormous massacres that the CIA compared to the crimes of Hitler, Stalin and Mao. These were, however, greeted with unconstrained euphoria in the US and the West generally because the “staggering bloodbath,” as the press cheerfully described it, ended any threat of contagion and opened Indonesia’s rich resources to western exploitation. After that, the war to destroy Vietnam was superfluous, as Bundy recognized in retrospect. Much the same was true in the Middle East. The unique US relations with Israel were established in their current form in 1967, when Israel delivered a smashing blow to Egypt, the center of secular Arab nationalism. By doing so, it protected US ally Saudi Arabia, then engaged in military conflict with Egypt in Yemen. Saudi Arabia, of course, is the most extreme radical fundamentalist Islamic state, and also a missionary state, expending huge sums to establish its Wahhabi-Salafi doctrines beyond its borders. It is worth remembering that the United States, like England before it, has tended to support radical fundamentalist Islam in opposition to secular nationalism, which has usually been perceived as posing more of a threat of independence and contagion. One answer is: security for state power. There are many illustrations. Take a current one. In May, the US agreed to support a UN Security Council resolution calling on the International Criminal Court to investigate war crimes in Syria, but with a proviso: there could be no inquiry into possible war crimes by Israel. Or by Washington, though it was really unnecessary to add that last condition. The United States is uniquely self-immunized from the international legal system. In fact, there is even congressional legislation authorizing the president to use armed force to “rescue” any American brought to the Hague for trial—the “Netherlands Invasion Act,” as it is sometimes called in Europe. That once again illustrates the importance of protecting the security of state power. When the NSA’s surveillance program was exposed by Edward Snowden’s revelations, high officials claimed that it had prevented fifty-four terrorist acts. On inquiry, that was whittled down to a dozen. A high-level government panel then discovered that there was actually only one case: someone had sent $8,500 to Somalia. That was the total yield of the huge assault on the Constitution and, of course, on others throughout the world. Another concern is security for private power. One current illustration is the huge trade agreements now being negotiated, the Trans-Pacific and Trans-Atlantic pacts. These are being negotiated in secret—but not completely in secret. They are not secret from the hundreds of corporate lawyers who are drawing up the detailed provisions. It is not hard to guess what the results will be, and the few leaks about them suggest that the expectations are accurate. Like NAFTA and other such pacts, these are not free trade agreements. In fact, they are not even trade agreements, but primarily investor rights agreements. Let us turn to another question: What about the security of the population? It is easy to demonstrate that this is a marginal concern of policy planners. Take two prominent current examples, global warming and nuclear weapons. As any literate person is doubtless aware, these are dire threats to the security of the population. Turning to state policy, we find that it is committed to accelerating each of those threats—in the interests of the primary concerns, protection of state power and of the concentrated private power that largely determines state policy. Consider global warming. There is now much exuberance in the United States about “100 years of energy independence” as we become “the Saudi Arabia of the next century”—perhaps the final century of human civilization if current policies persist. These conclusions are fortified by a closer look at the propaganda system. There is a huge public relations campaign in the US, organized quite openly by Big Energy and the business world, to try to convince the public that global warming is either unreal or not a result of human activity. And it has had some impact. The US ranks lower than other countries in public concern about global warming and the results are stratified: among Republicans, the party more fully dedicated to the interests of wealth and corporate power, it ranks far lower than the global norm. The current issue of the premier journal of media criticism, the Columbia Journalism Review, has an interesting article on this subject, attributing this outcome to the media doctrine of “fair and balanced.” In other words, if a journal publishes an opinion piece reflecting the conclusions of 97 percent of scientists, it must also run a counter-piece expressing the viewpoint of the energy corporations. That indeed is what happens, but there certainly is no “fair and balanced” doctrine. Thus, if a journal runs an opinion piece denouncing Russian President Vladimir Putin for the criminal act of taking over the Crimea, it surely does not have to run a piece pointing out that, while the act is indeed criminal, Russia has a far stronger case today than the US did more than a century ago in taking over southeastern Cuba, including the country’s major port—and rejecting the Cuban demand since independence to have it returned. And the same is true of many other cases. The actual media doctrine is “fair and balanced” when the concerns of concentrated private power are involved, but surely not elsewhere. On the issue of nuclear weapons, the record is similarly interesting—and frightening. It reveals very clearly that, from the earliest days, the security of the population was a non-issue, and remains so. There is no time here to run through the shocking record, but there is little doubt that it strongly supports the lament of General Lee Butler, the last commander of the Strategic Air Command, which was armed with nuclear weapons. In his words, we have so far survived the nuclear age “by some combination of skill, luck, and divine intervention, and I suspect the latter in greatest proportion.” And we can hardly count on continued divine intervention as policymakers play roulette with the fate of the species in pursuit of the driving factors in policy formation. As we are all surely aware, we now face the most ominous decisions in human history. There are many problems that must be addressed, but two are overwhelming in their significance: environmental destruction and nuclear war. For the first time in history, we face the possibility of destroying the prospects for decent existence—and not in the distant future. For this reason alone, it is imperative to sweep away the ideological clouds and face honestly and realistically the question of how policy decisions are made, and what we can do to alter them before it is too late.